I started with an e-mail containing this link. From eggplant, where many new obsessions start and are shared. Cupcakes in a jar. Huh? I saw the link and didn't really think about it again. . . but then it crept into my brain. Slowly at first. 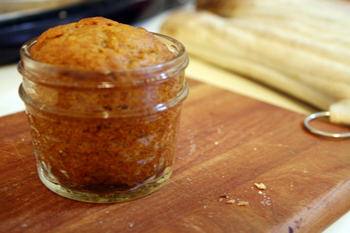 Before I realized it, I knew I had to try and make something baked in a jar. It became an obsession. The potential for gift giving seemed endless. They are perfect. Small, portable, weird, dessert-y and mildly trashy, yet have the ability to be quite cute and elegant. A cupcake in a jar google search didn't turn up much info, but a cake in a jar search was a goldmine. 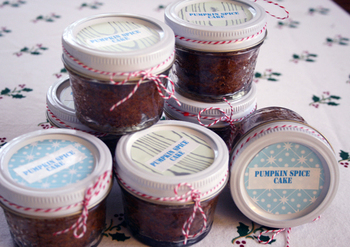 There is a ton of info out there about baking in jars. What a wonderful world it is. 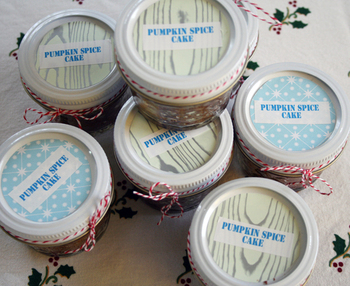 These are 1/2 pint jars of pumpkin spice cake (the recipe is from from mailorder last year.) I called eggplant the next day—she had been researching it too and we both had this bug real bad. About 5 calls and several e-mails later I told Grammie and like some sort of crafting angel she busts out with a case of these jars, brand new, she happened to have on hand and gave me 8. Awesome. I filled them in the next 12 hours. If you want to frost them you have to fill them less then I did, which was about 3/4 full. I just pressed the lid on and squished the cake down before they cooled. The result was a tender cake, almost like a pudding, because it steamed a bit. Heavenly. If you get a jar with straight sides and don't frost it, the cakes will slide out whole. No kidding. Just oil the jars first. I didn't flour mine and they still came out fine, but eating them out of the jar with a little spoon was more fun. The girls totally freaked out, and they don't even eat cake. Well, they do now. These actually seal when you close them up hot. Some sites say you can keep them, sealed, up to 6 months on a shelf. Of course boil the lids and all that—and no frosting, of course. I am keeping them in the freezer, they can thaw in a day, ready to be given out with holiday fanfare. My mind is racing now. . .cakes on picnics, in the mail (but they are heavy, that shipping would be expensive) and in lunch sacks, or you could keep one in your jacket pocket! And then Mariko and I discussed different jar contents; brownies, pound cakes, gingerbread, oh good lord. I am thinking some sort of pie type thing now, a graham cracker crust layer with fruit on top, or a creme pie. I mean, if I freeze them, I can fill them with whatever, right? We are both on a crazy cake in a jar train going in different directions. Mariko is going the light cake and frosting route, she dropped off a pint size which was an amazing chocolate cake with an espresso frosting. I am more about the dense cake, without frosting, and exploring packaging potential. We both agree the 1/2 pint size, which is so easy to accidentally overfill, is definitely the way to go for the cute factor. We both used our normal recipes, watched the baking time, (bake these on a rimmed sheet for easy removal) and then just winged it from there. 1/2 of a cake recipe easily filed 8 1/2 pint jars (about 8 oz) with some left over. I have calmed down, sort of. But really, there will be more of these. Baking in a jar. . . pure genius.